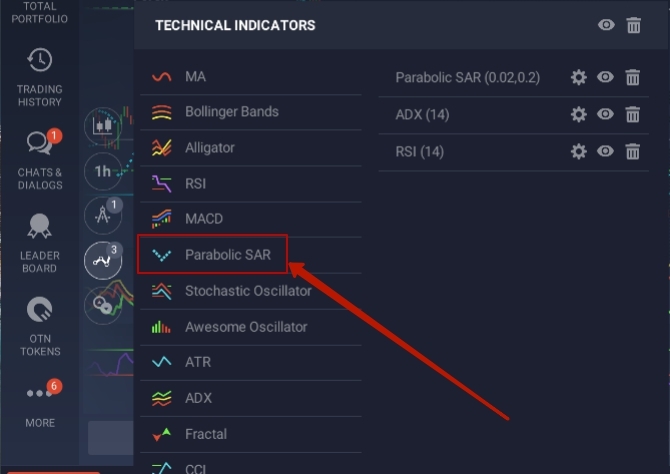 The Parabolic SAR (PSAR) indicator is a trend analysis instrument. Wells Wilder is trader which created this instrument in 1978. When author developed PSAR, main purpose of this indicator was a signal function, useful for financial analysts and traders, in to open and close deals in timely manner. And he succeeded. Now Parabolic SAR is a popular financial instrument. Indicator has helped many traders make profitable decisions for 40 years of existence, so it is among standard instruments at all known trading terminals. Indicator name “Parabolic” is due to its parabolic forms. SAR is an abbreviation (stop and reverse) it unequivocally speaks about the indicator main purpose, i.e., signaling of an early stop and forthcoming reversal of current trend. PSAR is applied together with price chart in points form on broker IQ Option site. Parabolic SAR principle operation like to moving average (MA) mechanism, but it is more accelerated. When the indicator points pass above price chart it means that now there is a downtrend. Conversely, when the indicator moves under the price diagram, that is uptrend. And the places where price and PSAR crossed are signals for opening new ones as well as for closing current deals. Trader need to select it from list of available indicators, to start working with PSAR. Instrument parameters window will open after that. Indicator has only one graphic variable: colour, and two numerical values: acceleration step, acceleration max. Acceleration step is value that determines strength of price action to calculate next step of financial instrument, and acceleration max is smooth out impact of acceleration step in conditions of high price volatility. Changing the numerical parameters is necessary in accordance with proportionality conditions, i.e. if user entered his value of the acceleration step, then acceleration max must be replace a directly proportional quantity. The less risky option for him will be leaving the default settings if the trader has not previously worked with this instrument. How to trade with Parabolic SAR on broker IQ Option site? PSAR with standard settings can be very late at small time intervals and be an inefficient instrument. Therefore, trader needs to experiment with the indicator settings and select convenient parameters for his trading strategy to trade on different timeframes. Instrument sensitivity will increase with PSAR settings (0.04, 0.4). It will respond even to less significant price changes. This configuration will work well on hourly timeframes when scalping the Forex market, as it will allow trader to make several profitable trades during day. Trader needs to wait several hours to make a decision to close deal, because the timeframe is 1 o’clock. To minimize the risk of losing deposit, parameters are set: AutoClosing and TakeProfits. PSAR (0,04; 0,4) crossed the price chart, thereby giving a signal to close deal. If user reduces parameters, indicator will be more smooth and show only significant changes in trend. 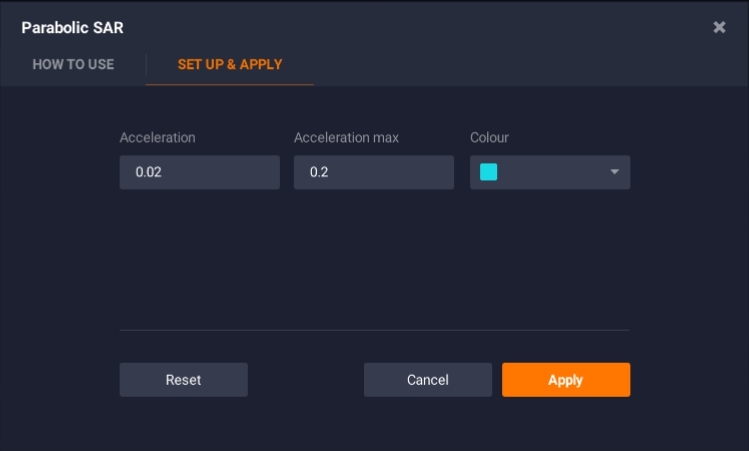 Such settings are suitable for trading on turbo options, where timeframes do not exceed 1 minute, because the signals will be less sensitive to distracting market noise. In this material, only general principles of using Parabolic SAR are described. User need to experiment a lot with both one PSAR and in together with other indicators, to get to know this legendary financial instrument closer, and start using it fully in trade. In addition, IQ Option demo-account allows each user to practice for a full understanding of instrument without risk of losing real money.